Bridget Holcomb. Photo courtesy of WFAN. Bridget Holcomb, newly appointed executive director of the non-profit Women, Food & Agriculture, has always been interested in issues concerning sustainability. For her, it’s a no brainer that the current generation needs to live sustainably to improve the lives of future generations. “For anyone interested in issues around sustainability, it is not long before we realize that food and agriculture is center to how we live sustainably,” she says. Denise O’Brian, a southwest Iowan farmer, founded WFAN in 1997 to help raise women’s voices who work in agriculture. For the past 17 years, WFAN has helped female farmers in the Midwest and other regions and world network and learn. Holcomb grew up in Minnesota and has lived in Illinois and Wisconsin. Since she’s spent her life in the Midwest, she understands the women the organization works with in the region. “What I find incredible about Midwestern women who start farming is that they do it for no other reason than that they love it, and what rewards them is knowing that they are feeding their community,” says Holcomb. Holcomb started her studies in sustainable agriculture and non-profit management with a bit of creativity and ingenuity of her own. 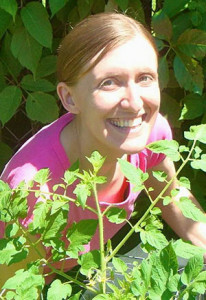 Although Holcomb doesn’t farm, she tends a small garden and uses crop rotation, mulching and composting. She hopes to incorporate oat cover crops this year. Holcomb came to her new positing already admiring what WFAN does and recognizes how important the organization is for women across the country. “I hope that I can help the organization grow so that we reach more women and that we help women get the recognition they deserve as a large, critical part of our agriculture,” she says. WFAN helps women in agriculture succeed and thrive by creating a supporting community. Women who work in agriculture can call WFAN to ask about resources available to them. They also come to the nonprofit’s conference to learn more in its workshops and to meet other women. The organization also has a newsletter containing other women’s farming stories. WFAN also helps share stories about how women make agriculture more sustainable. Holcomb says that an increasing number of women landowners are learning about cover crops, and are requiring their tenants use these and other erosion prevention measures. Holcomb says that Women often face a double whammy when they begin farming. In the future, Holcomb hopes that WFAN is a household name, and that when anyone thinks of agriculture, they think of women.